Our Expertise ranges from below grade and above grade, to split slab and parking decks. The waterproofing division crews can install fluid applied waterproofing, adhered rubber systems and total encapsulations with Bentonite. 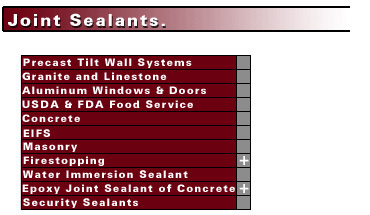 We are approved applicators of all these systems and can design and application that meets your building's needs. Above grade, we dampproofed over 750,000 sq. ft. of cavity wall per year. Our dedicated crews know the importance of getting on the job quickly, and working efficiently to keep the project on schedule. Our company was built on caulking and we are proud that no one does it better, and no one does more in the state of Michigan. No matter what the job, small or large, interior or exterior, Helms Caulking and Waterproofing can meet your every need. We complete over 500 jobs per year on ever substrate imaginable, from sealing sky rise exteriors, to water immersion sealant on holding tanks. Our crews are certified in fire stopping and can provide UL rated systems for your project. We also specialize in USDA and FDA approved applications in food service locations. Our trained crews will complete the job on time and in accordance with the specifictions. 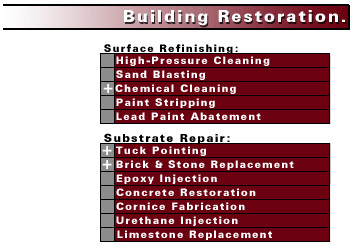 Restoration of existing buildings covers a wide variety of substrates and techniques. Our crews have the experience to tuck point a single motor joint or perform total restoration of historical landmarks, where we strive to achieve the original beauty of the structure. We can also rebuild to match existing arches, and restore original luster to substrates. Ever consideration is given to the building, surrounding conditions, and the environment before we advise a course of action. Water penetration is the greatest enemy to any building. No matter the substrate, water can penetrate through to your finished workplace causing extensive damage and expensive repairs. At Helms Caulking & Waterproofing, Inc. our experienced project managers will evaluate your building and recommend corrective action. We understand the importance of your uninterrupted business activity and will design work shcedules to meet those needs. When the project is completed, your water problems will be solved using an aesthetically pleasing finish which will meet your approval.